A private dorm at the University of Texas in Austin won’t let one of its freshman residents invite her girlfriend over, after other residents were reportedly uncomfortable with the couple. Kaj Baker resides in the Scottish Rite Dormitory, which is a private, off-campus dorm for women run by the Scottish Rite of Freemasons and founded in the early 1900s to provide housing options for women. After Baker was hanging out in the lounge with her girlfriend, like any couple might do, university paper The Daily Texan reports that Baker was asked to meet with the Scottish Rite Dormitory director Mary Mazurek and and registrar Meshelle Bourne. In an extremely smart move, Baker recorded the conversation. 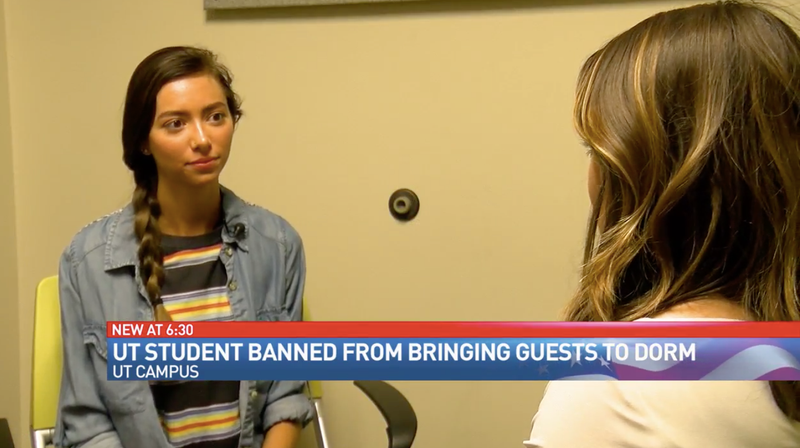 They explained to her that residents felt uncomfortable with her girlfriend studying with her in the lounge and hanging out in the dorm and that she would no longer be allowed to bring guests in for the rest of the semester. According to a recording Mazurek said, “We’re trying to make sure that everybody—all 315 residents—feels more comfortable... and sometimes that takes compromise on both sides to do that.” My question is, why choose to live with all women if you can’t stomach the reality that *gasp* many women date women? The decision to ban Baker from having guests isn’t based on any specific rule. Clearly, the dorm has never considered that gay women might live there. The Daily Texan found that there are no restrictions when it comes to female guests hanging out in the dorm, but men are only allowed in the dorm from noon to 10:00 p.m on Friday, Saturday and Sunday. Female guests who stay overnight are supposed to be registered, but Baker told Fox San Antonio her girlfriend never stayed overnight. “The list of complaints weren’t us doing anything wrong. We weren’t harming anyone. We weren’t doing PDA. We weren’t breaking any rules. It was us existing,” Baker told Fox San Antonio. “If this guest ban was simply about the rules then us being gay or me being gay should have never been brought into it at all,” she added.